It’s grilling time! Can’t you feel it? Until the last 2 days, the sun has been out. The sky has been blue. 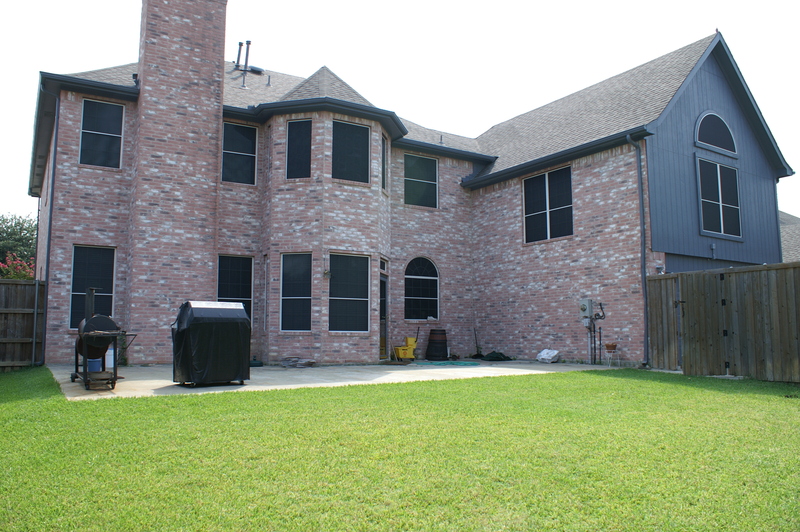 Everything in the backyard is green. Temperatures are creeping upwards into the high 80s low 90s but dropping into the high 70s at night. It’s that time of year when you want to spend time outside. 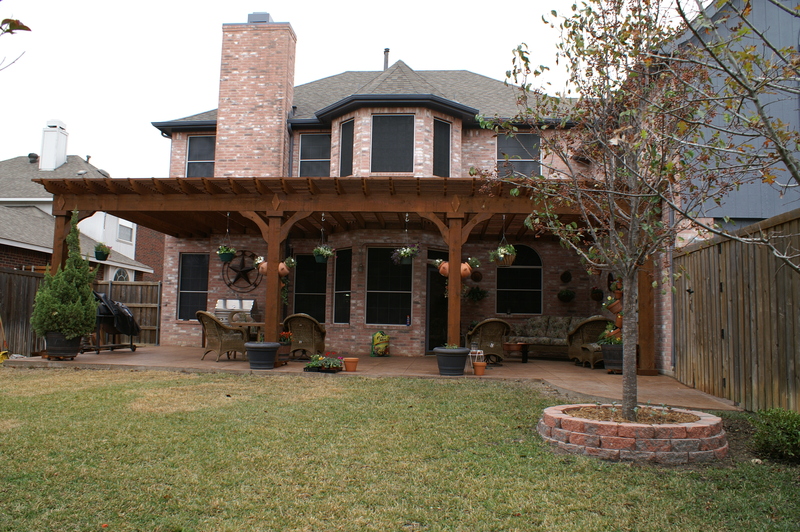 Before we built the arbor, it would get brutally hot and was simply too unpleasant to go outdoors. Even though I love to barbecue and grill, it was just not worth it to try. The sun baked you through and through. With the arbor, now we get some respite from the summer heat. Not only did it make it bearable and down right nice to go outside, but it took the heat off the back of the house, as well. Now, we cook outside again. We eat outside now and we even have an entertaining area outside. It’s one of the nicest things Baby Lady ever did for me. Because we have been having such beautiful weather, this past weekend I decided grilling was the way to go. 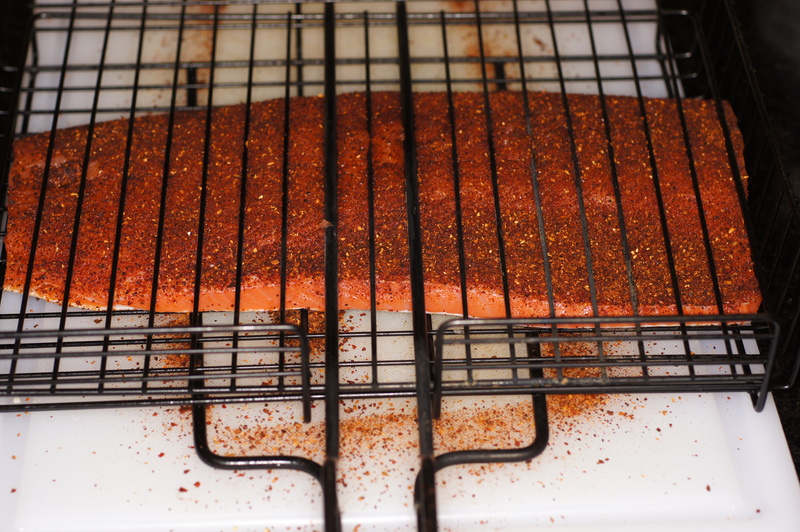 You have already seen several recipes using the ancho chile rub I love with fish. Our favorite market had beautiful fresh, wild coho salmon in stock. So, we decided we would do a little southwestern meal. 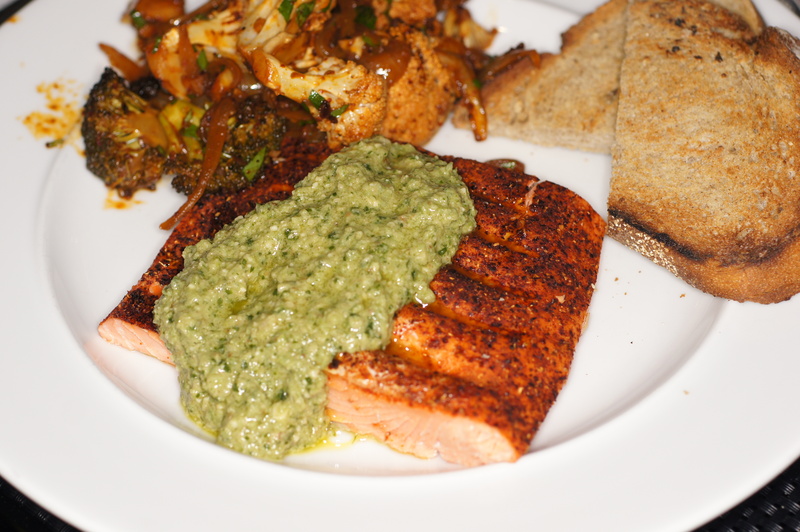 Grilled Ancho Crusted Coho Salmon with a Poblano Pesto, served with a spinoff of the Roasted Cauliflower with Red Chile, Cilantro & Lime. The net out of this meal was simply fantastic. The earthiness of the ancho chile rub (not surprisingly) paired with the freshness of the roasted poblano, cilantro and lime in the pesto, which, in turn, played nicely with the flavors of the roasted broccoli, onions and cauliflower with red chile, cilantro and lime. A beautiful dish with remarkable flavors. Get your grill hat on, get the tongs, fire up the grill and let’s get grillin’. 1 Fresh, Wild Coho Salmon, approximately 1-1/2 lb. Roast, peel and seed the chiles. For instructions on roasting chiles, click here. Place chiles in your food processor and pulse until coarsely chopped. Add cilantro, garlic, and lime. Puree mixture until smooth. Add the walnuts and pulse until finely chopped. While the food processor is running, drizzle in olive oil. Last, add the parmesan cheese and pulse to incorporate and distribute flavors. 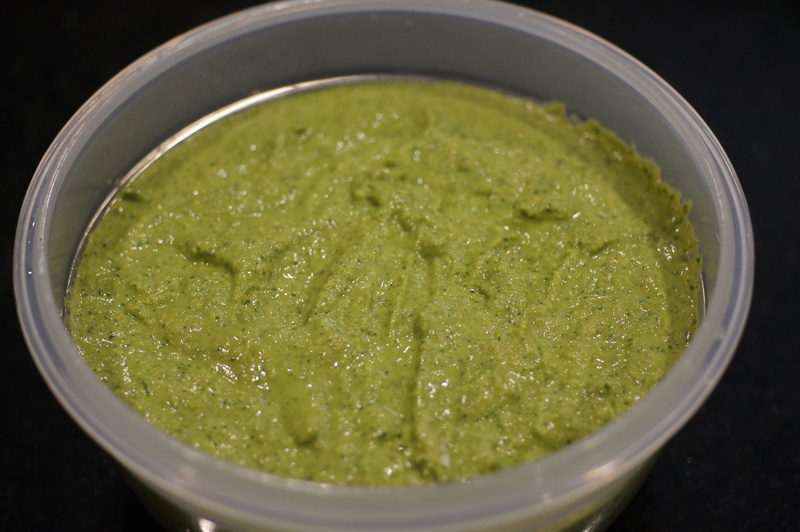 Pesto can be stored in your refrigerator up to 1 week. 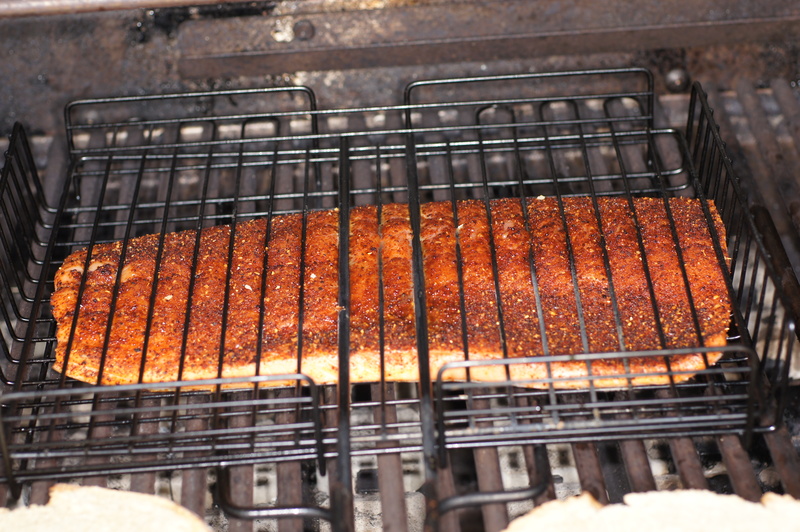 Season the salmon with the Ancho Chile Rub and place in the grilling basket. Place grilling basket over medium heat on your grill and grill skin side down for 3 minutes. Flip and grill another 2 minutes. Remove from grill and carefully remove salmon from grilling basket so as not to break up the salmon. Cut into 4 equal pieces. 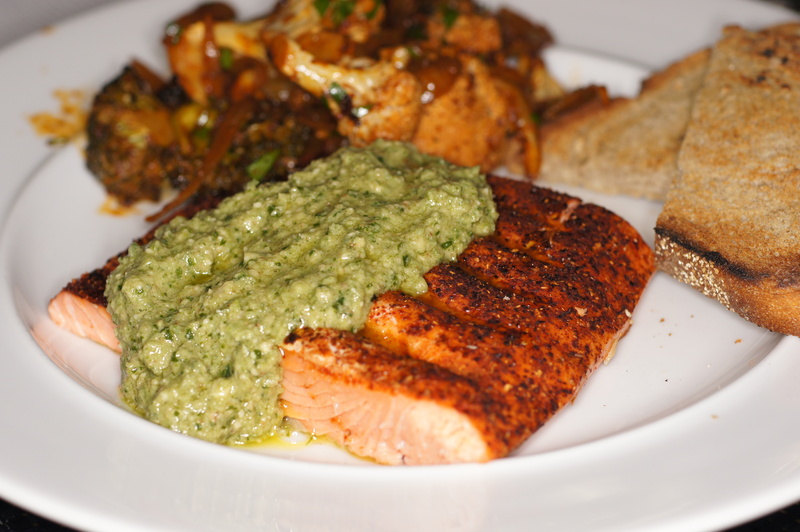 Place on plate and top with poblano pesto. Serve with a veggie and enjoy. YUM!! Loving the poblano pesto!! Thanks for the inspiration! Thanks for dropping by and the nice comment. It goes great with fish, tacos, sandwiches and pasta. Good food, nice ambiance and sunny weather…the perfect recipe! It couldn’t have been more perfect. Thanks for dropping by. The salmon looks amazing. Going to have to try this one out. Thanks for your nice comment. I hope you give it a try on your green egg. Let me know how it turns out. Will do. We love grilling and planking salmon on the Egg. Looks DELICIOUS! I just love grilled fish, and your rub sounds very versatile. Bet it’s good on chicken, too! Gorgeous! This sounds so light and delicious. Love that green color!